Home / Unlabelled / WAS ISLAM REALLY SPREAD BY THE SWORD? The noted historian De Lacy O'Leary wrote: "History makes it clear however, that the legend of fanatical Muslims sweeping through the world and forcing Islam at the point of the sword upon conquered races is one of the most fantastically absurd myths that historians have ever repeated." The facts speak for themselves: Indonesia is the country that has the largest number of Muslims in the world, and the majority of people in Malaysia are Muslims. But, no Muslim army ever went to Indonesia or Malaysia. It is an established historical fact that Indonesia entered Islam not due to war, but because of its moral message. Despite the disappearance of Islamic government from many regions once ruled by it, their original inhabitants have remained Muslims. Moreover, they carried the message of truth, inviting others to it as well, and in so doing endured harm, affliction and oppression. The same can be said for those in the regions of Syria and Jordan, Egypt, Iraq, North Africa, Asia, the Balkans and in Spain. This shows that the effect of Islam on the population was one of moral conviction, in contrast to occupation by western colonialists, finally compelled to leave lands whose peoples held only memories of affliction, sorrow, subjugation and oppression. An article in Reader's Digest 'Almanac,' yearbook 1986, gives the statistics of the increase of the percentage of the major religions of the world in half a century from 1934 to 1984. This article also appeared in The Plain Truth magazine. At the top was Islam, which increased by 235 percent, while Christianity had increased by 47 percent. During this fifty-year period, there was no "Islamic conquest" yet Islam spread at an extraordinary rate. Today the fastest growing religion in America and Europe is Islam. The Muslims in these lands are a minority. The only sword they have in their possession is the sword of truth. 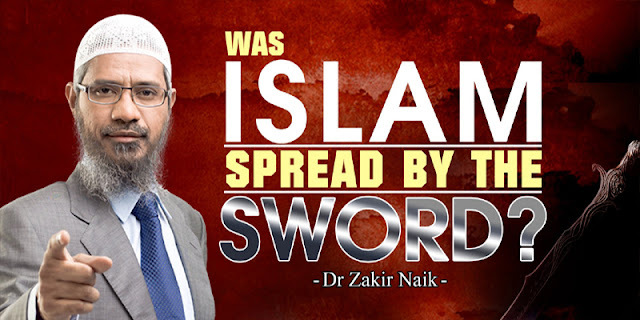 It is this sword that is converting thousands to Islam. Islamic law protects the privileged status of minorities, and that is why non-Muslim places of worship have flourished all over the Islamic world. Islamic law also allows non-Muslim minorities to set up their own courts, which implement family laws drawn up by the minorities themselves. The life and property of all citizens in an Islamic state are considered sacred whether they are Muslims or not. It is clear, therefore, that Islam did not spread by the sword. The "sword of Islam" did not convert all the non-Muslim minorities in Muslim countries. In India, where Muslims ruled for 800 years, they are still a minority. In the US, Islam is the fastest growing religion and has over six million followers.